Research aim: This paper reviews the research literature and publications relevant to audit quality. The authors identify three main perspectives (academic research, professional and regulatory) related to audit quality that could add to our understanding of the concepts and factors affecting audit quality in practice. For each reviewed perspective, the authors present and summarise the key findings. Design/ Methodology/ Approach: This study reviews a total of 84 empirical studies and publications ranging from year 1980 to year 2016. Further, this paper links academic research to publications on the topic issued by professional practitioners and regulators. Research findings: Based on the analysis, the review reveals three main findings. 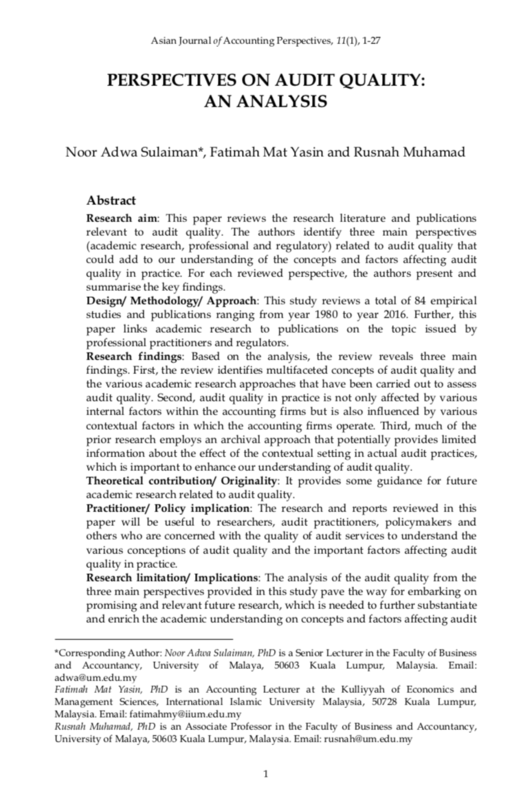 First, the review identifies multifaceted concepts of audit quality and the various academic research approaches that have been carried out to assess audit quality. Second, audit quality in practice is not only affected by various internal factors within the accounting firms but is also influenced by various contextual factors in which the accounting firms operate. Third, much of the prior research employs an archival approach that potentially provides limited information about the effect of the contextual setting in actual audit practices, which is important to enhance our understanding of audit quality. Theoretical contribution/ Originality: It provides some guidance for future academic research related to audit quality. Practitioner/ Policy implication: The research and reports reviewed in this paper will be useful to researchers, audit practitioners, policymakers and others who are concerned with the quality of audit services to understand the various conceptions of audit quality and the important factors affecting audit quality in practice. Research limitation/ Implications: The analysis of the audit quality from the three main perspectives provided in this study paves the way for embarking on promising and relevant future research, which is needed to further substantiate and enrich the academic understanding on concepts and factors affecting audit quality. More research is needed to understand this issue better and to move towards a policy resolution. SULAIMAN, Noor Adwa; MAT YASIN, Fatimah; MUHAMAD, Rusnah. Perspectives of Audit Quality: An Analysis. Asian Journal of Accounting Perspectives, [S.l. ], v. 11, n. 1, p. 1-27, aug. 2018. ISSN 0128-0384. Available at: <https://ajap.um.edu.my/article/view/13675>. Date accessed: 20 apr. 2019.